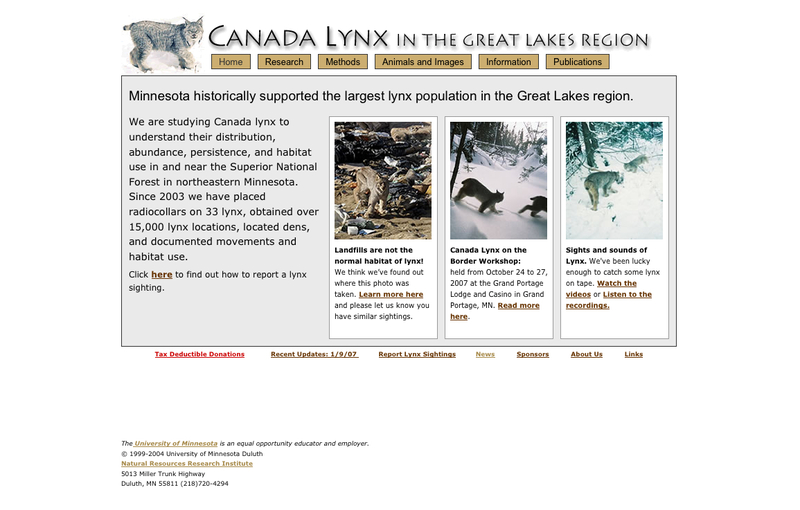 We are studying Canada lynx to understand their distribution, abundance, persistence, and habitat use in and near the Superior National Forest in northeastern Minnesota. Since 2003 we have placed radiocollars on 33 lynx, obtained over 15,000 lynx locations, located dens, and documented movements and habitat use. 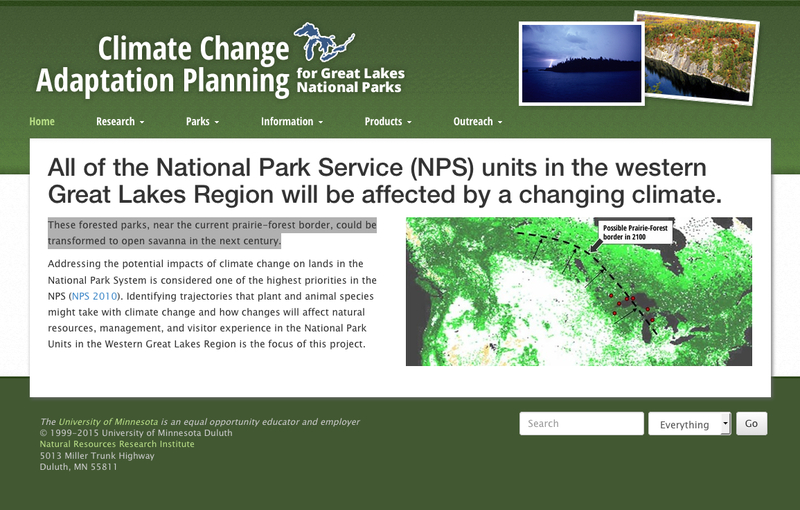 All of the National Park Service (NPS) units in the western Great Lakes Region will be affected by a changing climate. These forested parks, near the current prairie-forest border, could be transformed to open savanna in the next century. Addressing the potential impacts of climate change on lands in the National Park System is considered one of the highest priorities in the NPS. Identifying trajectories that plant and animal species might take with climate change and how changes will affect natural resources, management, and visitor experience in the National Park Units in the Western Great Lakes Region is the focus of this project. 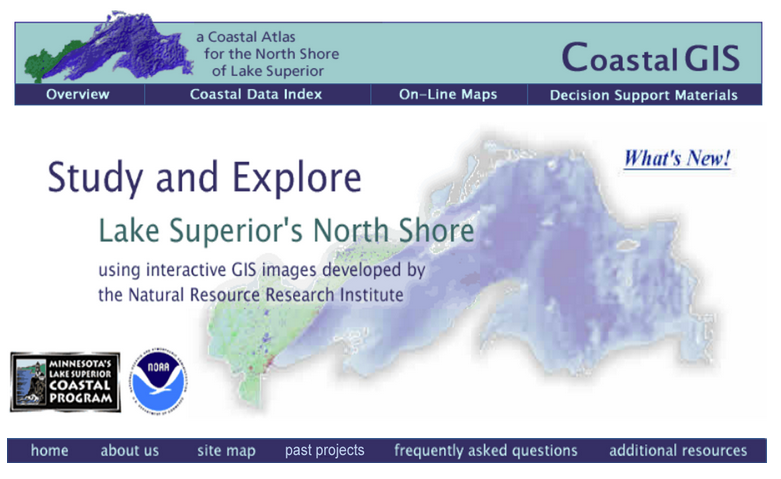 Coastal GIS is an effort to assemble spatial data and develop decision support tools for the aquatic and terrestrial resources within Minnesota's Lake Superior Coastal zone. These data and tools will be delivered to end users via the Internet, CD-ROMs and institutional outreach efforts. 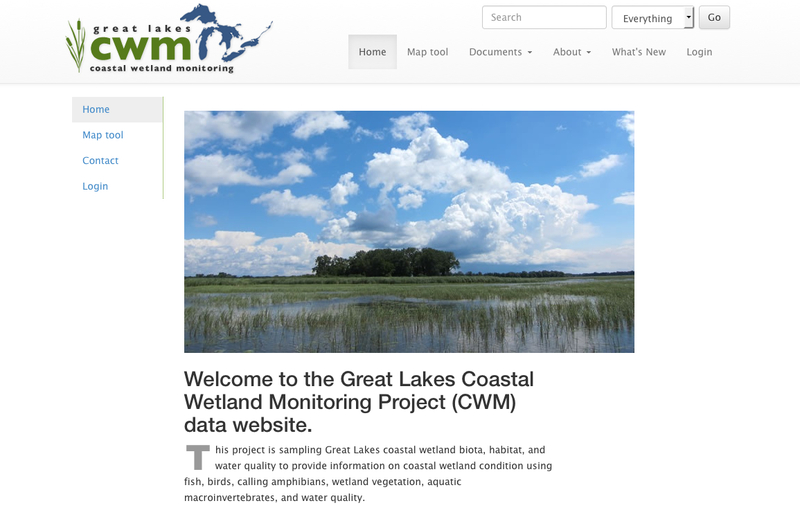 This project is sampling Great Lakes coastal wetland biota, habitat, and water quality to provide information on coastal wetland condition using fish, birds, calling amphibians, wetland vegetation, aquatic macroinvertebrates, and water quality. 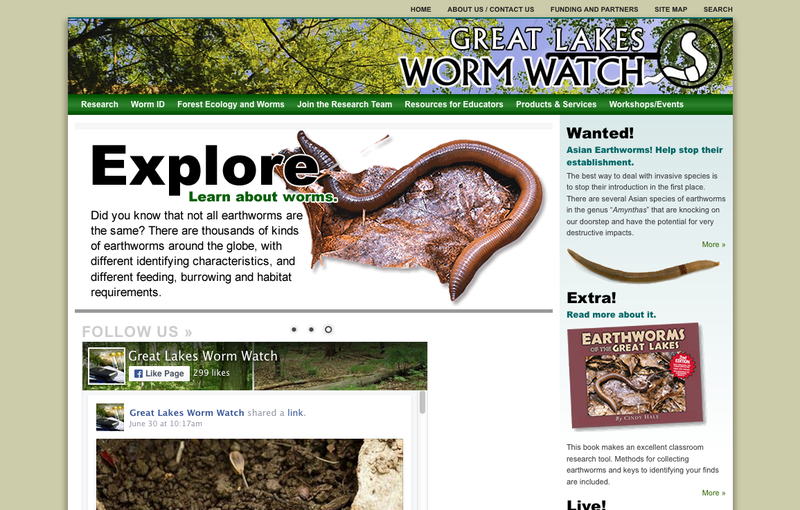 Great Lakes Worm Watch is committed to increasing scientific literacy and public understanding of the role of exotic species in ecosystems change. We provide the tools and resources for citizens to actively contribute to the development of a database documenting the distributions of exotic earthworms and their impacts across the region as well as training and resources for educators to help build understanding of the methods and results of scientific research about exotic earthworms and forest ecosystems ecology. 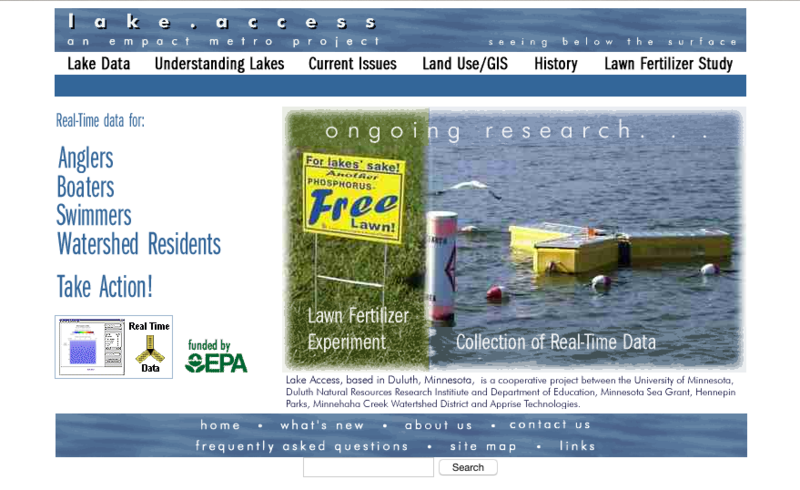 Lake Access is an initiative begun in 1999 to deliver real-time water quality information on Minneapolis metropolitan lakes to the public using advanced sensor technology and the Internet. Beginning in 2001 the project was expanded to include a study of the effects of lawn fertilizer phosphorus on the phosphorus budget of nearby Medicine Lake that suffers from eutrophication due to excessive phosphorus inputs. Duluth, Minnesota lies at the western end of Lake Superior, the source and headwaters of the entire Laurentian Great Lakes ecosystem. Although perhaps better known for extremely cold winters, residents and visitors know it to be a city of forested hills, wetlands and trout streams. 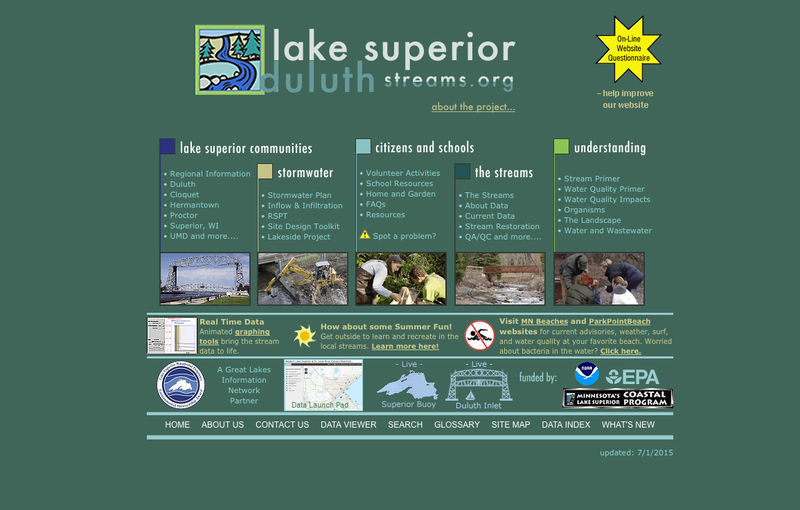 With 42 named streams, Duluth has one of the highest densities of stream corridors of any of the over 150 EMPACT- metro areas. 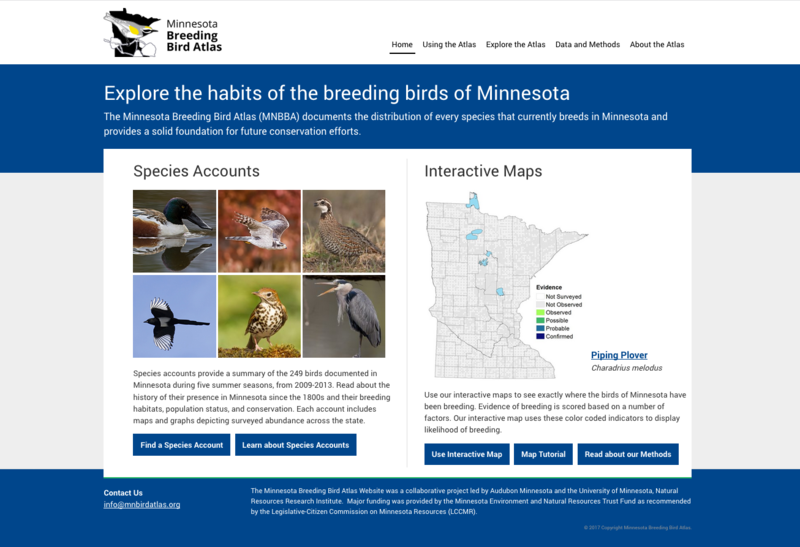 The Minnesota Breeding Bird Atlas (MNBBA) documents the distribution of every species that currently breeds in Minnesota and provides a solid foundation for future conservation efforts. The goal of the program is to assure a safe and healthy aquatic recreational environment by informing the water-going public about risk of contracting water-borne diseases from exposure to contaminated waters. The program collects samples from 38 Lake Superior beaches and analyzes those samples for water-borne diseases and human health risks. 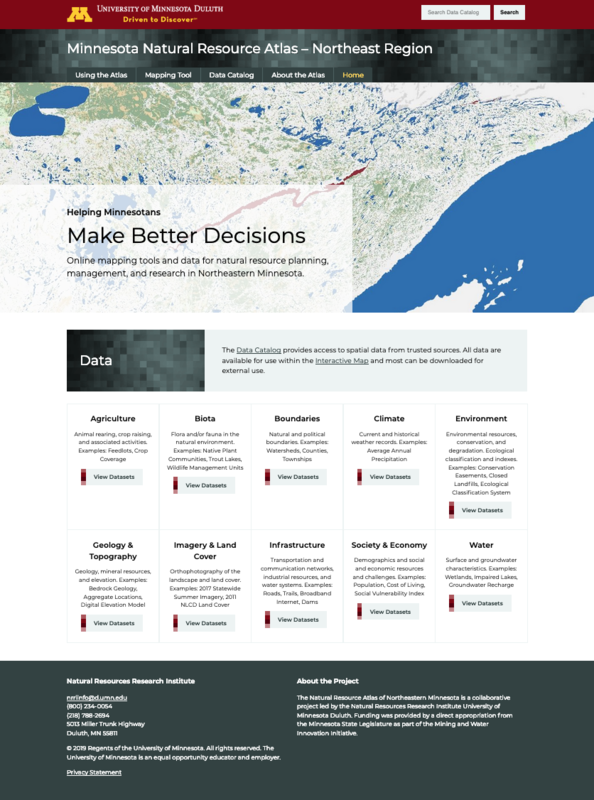 The Natural Resource Atlas of Northeastern Minnesota was developed to facilitate communication and improve the process of making decisions that impact our natural resources. The primary goal of the project was to make information available and accessible. This was accomplished by developing a publicly-accessible website that has two main components: a spatial database with over 275 multi-disciplinary data layers and an intuitive, interactive mapping tool that allows users to view, explore, analyze, and share the information contained within that data. 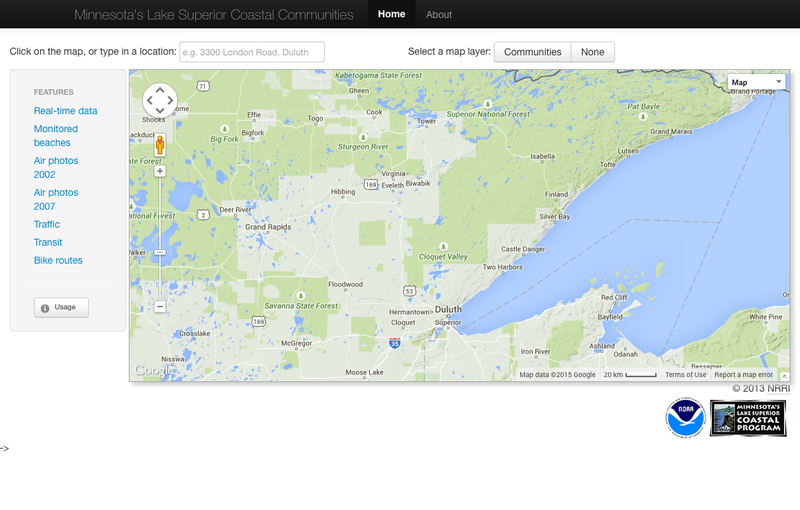 This web site is a window to a large number of information sources and data sets relevant to the coastal communities of Minnesota’s Lake Superior North Shore. 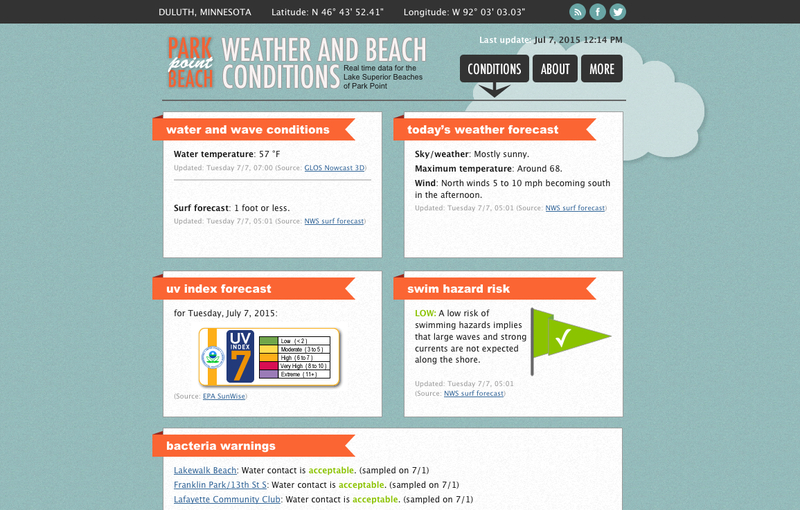 Resources include real-time information on weather, traffic and beach conditions, as well as map information on recreational opportunities, population and land cover. Investigating moose populations in Northern Minnesota. 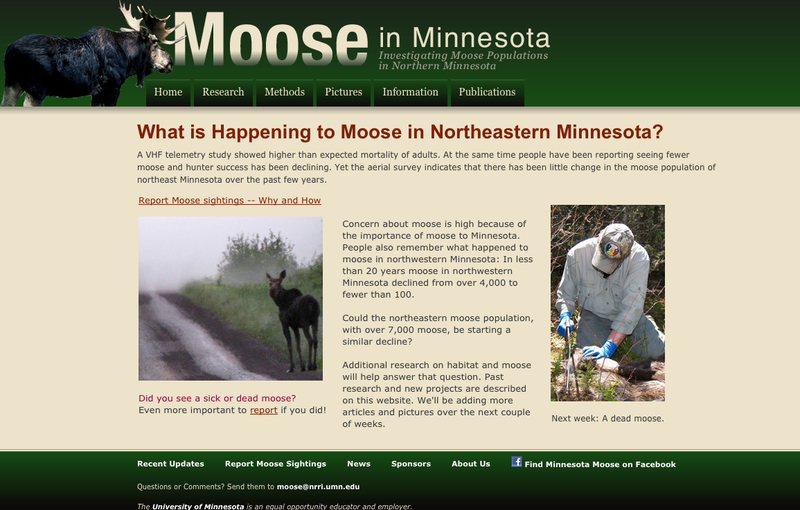 Concern about moose is high because of the importance of moose to Minnesota. People also remember what happened to moose in northwestern Minnesota: In less than 20 years moose in northwestern Minnesota declined from over 4,000 to fewer than 100. 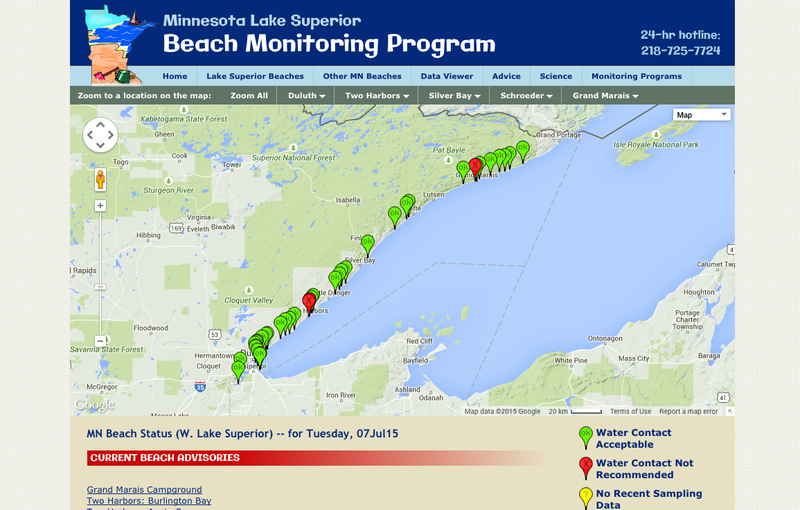 Real time data for the Lake Superior Beaches of Park Point. Our mission is to provide accurate and timely information to the public about the conditions on Park Point Beach, a Lake Superior sandbar within the City of Duluth, Minn.
Minnesota wetlands provide a wealth of ecological benefits including water quality and habitat enhancement. Yet, it is estimated that Minnesota has lost over 52 percent of its pre-settlement wetland area and their associated benefits. 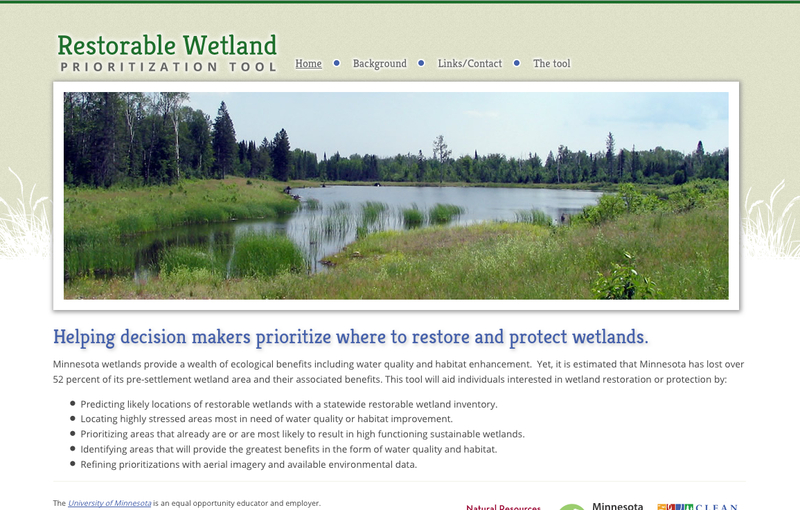 This tool will aid individuals interested in wetland restoration or protection. Explore the Stories of the Estuary through the eyes of people that live and work here, and delve into the Science of the interplay between humans and ecosystems. 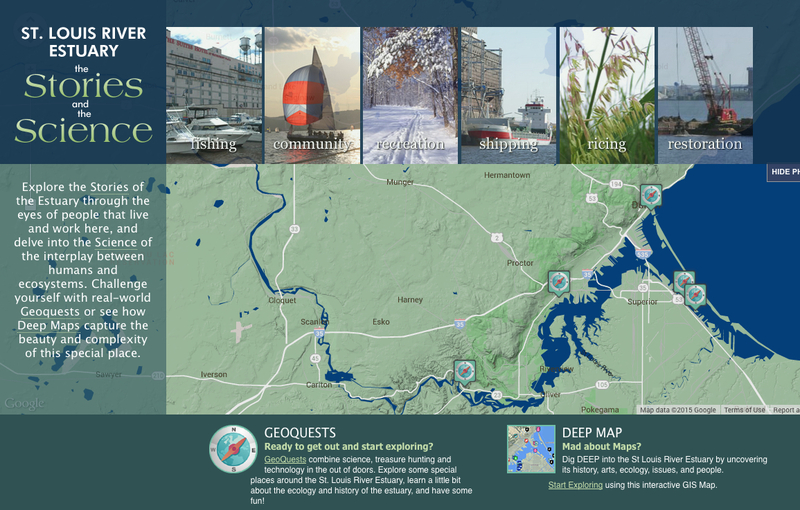 Challenge yourself with real-world Geoquests or see how Deep Maps capture the beauty and complexity of this special place. Water on the Web (WOW) helps college and high school students understand and solve real-world environmental problems using advanced technology. 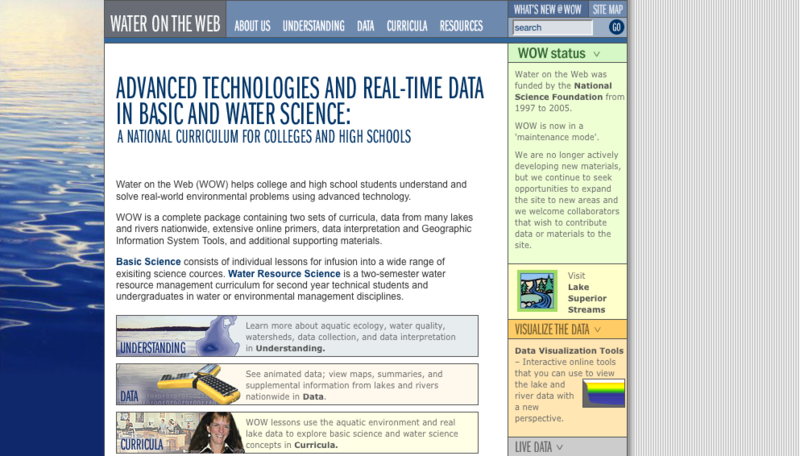 WOW is a complete package containing two sets of curricula, data from many lakes and rivers nationwide, extensive online primers, data interpretation and Geographic Information System Tools, and additional supporting materials.